Similar species: H. albus, H. muticus, H. retculatus, H. aureus, H. pusillus; allied species include Datura stramomiun (Datura), Atropa belladonna (Belladonna). Plant description: Black henbane is an annual (var. beta-annua) or biennial (var. alpha-biennis). The annual plant has a simple stem, attaining a height of between 25 and 50 cm in height, with sessile ovate-oblong to triangular ovate leaves. The biennial stem is very short in the first year, with large hairy ovate-lanceolate leaves arranged in a basal rosette. The second year the branched stem arises up to 1.5 meters tall, the sessile leaves ovate-oblong to triangular ovate, with coarsely toothed edges, covered in a pubescence, especially along the mid-rib and veins. The leaves of both varietals have a pungent, unpleasant odour. The flowers in the second year biennial or in the annual appear by summer, carried on long racemes in axils of upper leaves, brownish-yellow with a purple center and purple veins. The pineapple-shaped fruits are arranged in two rows, approximately 2-3 cm long, with five lobes, containing hundreds of tiny black seeds. Habitat, ecology and distribution: Henbane is native to Eurasia, and has since naturalized in the Americas. It can be found wild as a weed, growing in pastures, along roadsides, and in waste areas, but is also under cultivation as a herb of commerce, and can be found as a garden ornamental. History: Henbane has long been known to herbalists all over the world, and figured importantly in the practices of Ayurvedic, Chinese and Unani medicine, used as an analgesic and sedative. In ancient and medieval Europe Henbane was considered to have magical properties, serving as the base of a ‘flying’ ointment used by female shamans to induce a state of altered consciousness. This ointment was prepared as a salve and then introduced intavaginally, sometimes by smearing it onto the end of a broomstick – hence the myth of witches flying on their brooms. Henbane also found its way as an ingredient in the manufacture of beer, and was observed to promote states of altered consciousness. Often these recipes were closely guarded family secrets, with the women of the household responsible for gathering the herbs and mixing them for use in the preparation of beer. With the advent of Christianity the altered states of consciousness induced by the Henbane beer became increasingly associated with the malignant effects of devilish influences. In this respect the witches cauldron, another archetype of satanic influences, was probably more correctly the brewer’s kettle. The toxic effects of Henbane also finds its way into the works of Shakespeare, where Hamlet states: “Sleeping within mine orchard, My custom always of the afternoon, Upon my secure hour thy uncle stole, With juice of cursed hebenon (Henbane) in a vial, And in the porches of mine ear did pour the leprous distillment.” Occasionally the fruit of Henbane was mistaken for Hazelnuts, with disastrous consequences. Gerard states that “…the leaves, the seeds and the juice, when taken internally cause an unquiet sleep, like unto the sleep of drunkenness, which continueth long and is deadly to the patient.” Culpepper adds that Henbane is under the dominion of Saturn because it tends to grow in high nutrient areas in and around outhouses, sewer outfalls and ditches. Constituents: Henbane, like Datura and Belladonna, is noted for its tropane alkaloids (0.03-0.15%), including hyoscyamine, hyoscine (scopolamine), and atropine. Atropine is derived from the racemization of hyocyamine, a process that occurs upon drying (when the L-amino acid group gradually changes to D [right-handed] conformation). The difference between these three plants is the amount of tropane alkaloids found in each, and the ratio of hyoscyamine to hyoscine. Henbane is generally considered to be the weaker of the three because it has slightly less of the alkaloids, up to 0.15%, whereas Datura contains upwards of 0.45%, and Belladonna 0.6% (0.8% in the root). Henbane also contains an almost equal ratio of hyoscine to hyoscyamine, whereas Datura contains a ratio of 1:2 for hyoscine and hyoscyamine, respectively. Belladonna contains upwards of 20 parts hyoscyamine for every part hyoscine. Thus Datura is mildly stronger than Henbane, with Belladonna being the most potent among the three, and therefore the most toxic. 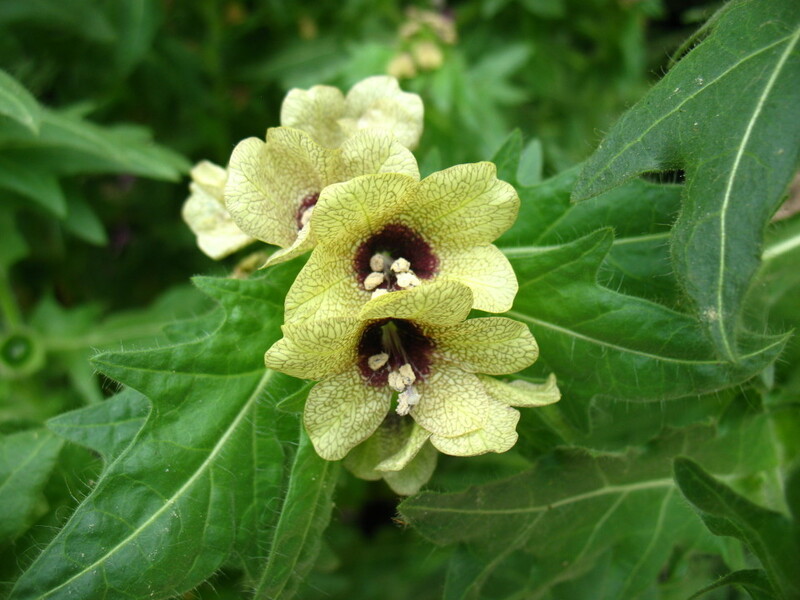 Other alkaloids found in Henbane include the N-oxides of hyoscyamine and hyoscine, with small amounts of atropamine (apoatropine) and cuscohygrine. Henbane is also stated to contain the flavonoid glycosides quercetin, rutin and kaempferol, and volatile amines such as choline, methylpyrroline and pyridine (Bradley 1992, 31, 131; Evans 1988, 545-562). Medical Research: The physiological effect of the tropane alkaloids is well-established. Both hyoscyamine and hyoscine have a parasympatholytic effect, competing with and inhibiting the activity of the neurotransmitter acetylcholine, decreasing parasympathetic responses such as sweating, salivation, gastric secretion and smooth muscle contraction in the urinary, respiratory and gastrointestinal tracts. Vagal stimulation is inhibited, leading to tachycardia and possible fibrillation. In larger doses the patient’s pulse will be quickened and the pupils dilated. This later effect is the source of the name Belladonna, which means ‘beautiful woman’ in Italian, referring its former usage to make the eyes more appealing. To this end atropine in commonly used as a topical solution by opththamologists to dilate the pupil when examining the retina. The biological activity of hyoscyamine is dependent upon its isomeric conformation: L-hyoscyamine is much more potent than D-hyoscyamine (i.e. atropine), and thus dried plant preparations are less potent than fresh. Furthermore, unlike hyoscyamine, which has potent effects upon both the central and peripheral nervous systems, hyoscine acts primarily upon the PNS, and thus Henbane lacks the same degree of cerebral effects as Belladonna (Bradley 1992, 131). Toxicity: Unlike most medical plants all the tropane alkaloid-containing plants have a fairly narrow therapeutic window. This is to say, the therapeutic dose is very close to symptoms of toxicity, and thus the dose and the patient’s response needs to be carefully monitored. Some practitioners will prescribe Henbane, Belladonna or Datura until the first initial symptoms of toxicity appear, such as a dry mouth. Beyond this, a dose too large will cause pupil dilation, difficulty swallowing, cardiac excitement, restlessness, hallucinations, delirium and coma. In most cases these herbs can be administered at a threshold below that at which any symptoms of toxicity appear. A dry mouth and visual disturbances are indications that the dose should be lowered. Contraindications and cautions: glaucoma, obstructive uropathies (e.g. benign prostatic hypertrophy), obstructive disease of the gastrointestinal tract (e.g. pyloric stenosis), intestinal atony, hypertension, toxic megacolon (complicating ulcerative colitis), myasthenia gravis, pregnancy, lactation. Henbane, Belladonna and Datura should not be used with medications that have an anticholinergic action, including tricyclic antidepressants, MAO inhibitors, quinidine, antiepileptics, anticonvulsants, antipsychotics, antihistamines and amantadine. Medicinal uses: Henbane is used principally whenever there is smooth muscle spasm that cannot be controlled by less potent methods. It acts quickly to reduce chronic and acute spasm in the gastrointestinal, respiratory and urinary tracts, checking excessive secretion and inflammation. In digestive disorders it is particularly valued with symptoms of hyperacidity, and in spasms of the stomach, intestine, gall bladder and colon. It is particularly helpful when used in formulation to treat colitis and inflammatory bowel disease when immunological triggers in the diet have been removed, the gut ecology corrected, and metabolic causes of inflammation have been addressed (e.g. omega-3 fatty acid supplementation), but the bowel remains in a state of hyperactivity. To this end Henbane is used along with other antispasmodics (e.g. Humulus, Dioscorea), cholagogues to correct bile excretion (e.g. Berberis) and vulneraries to heal the inflamed mucosa (e.g. Quercus, Calendula). In the treatment of asthma, Henbane is an exceptional remedy to reduce spasm, used along with expectorants such as Prunus (Wild Cherry bark), Inula (Elecampane). At one time Henbane, or more commonly Datura, was smoked or burned as an incense for this purpose. In the treatment of urinary spasm secondary to a severe urinary tract infection Henbane is an exceptionally helpful remedy when combined along with antimicrobials (e.g. Chimaphila, Artostaphylos) and urinary demulcents (e.g. Zea, Althaea). Henbane also finds use in the treatment of Parkinsonism and epilepsy, although extreme care should be taken when used along with conventional drug therapies. In Parkinson’s disease Henbane is used along with trophorestoratives (e.g. Avena, Withania) and herbs that naturally contain high levels of natural L-dopa (e.g. Mucana pruriens, Astragalus), to control symptoms and delay the usage of synthetic L-dopa (Carbidopa). Many patients will find that their symptoms are well-controlled by such treatment, and while it is not a cure per se, they can remain free of the side-effects that occur with conventional anticholinergic and L-dopa therapies. Henbane can be similarly used for senile tremor that has not been diagnosed as Parkinsonism, in cerebral palsy and in other spasmodic afflictions. In the treatment of epilepsy Henbane is an important remedy in grand mal seizure. Combined with antispasmodic herbs such as Cimicifuga and Lobelia, as well as nervine trophorestoratives such as Avena and Turnera, the use of Henbane can be very helpful to limit the effect or duration of seizure, as well as significantly increase the duration between episodes. Applied topically, Henbane tincture or oil is an effective analgesic in neuralgia. • Dry Plant Tincture: 1:10, dried herb, 40-70% alcohol, 1-10 gtt., up to 20 mL per week. The British Herbal Compendiumallows a dose of the 1:10 tincture up to 2-5 mL (1992, 131).